The Top 10 Innovations of 2011 include a number of the latest advances in microscopy—from a pocket microscope that can be connected to a cell phone’s optics to tools that smash the resolution limitations of traditional scopes, a neat tool to measure light exposure and circadian rhythms, and a first-of-its-kind 360-degree optical imager. Congratulations to all the winners of 2011’s Top 10 Innovations contest, and here’s to the researchers who will use these tools to break new scientific ground and expand our understanding of biology in the months and years to come. Diagnosing malaria or other blood-borne illnesses used to require analyzing cell slides under a bulky, costly light microscope—which can be difficult to find in impoverished, remote locations. Enter LUCAS (Lensless, Ultra-wide-field Cell monitoring Array platform based on Shadow imaging), an easy-to-use, pocket-size holographic microscope that weighs less than 50g, uses inexpensive, off-the-shelf parts, and can be attached to a cell phone’s camera, making it ideal for diagnosing disease in isolated, developing countries. “In resource-poor areas, you don’t have a hospital or any other infrastructure to conduct all these tests, so if you could simplify all this microscopy you could really have a huge impact,” says the microscope’s inventor, Aydogan Ozcan, an electrical engineer at the University of California, Los Angeles (UCLA). LUCAS, which could cost as little as $10, illuminates cells with an inexpensive light-emitting diode, captures the shadows they cast, and then processes and recreates the image using an algorithm run on a remote computer. The translucent cells cast “textured” shadows that can reveal internal cell features such as malaria parasites. The microscope has submicrometer resolution but can image very large areas, Ozcan says. And because cell phone networks are ubiquitous, “even in an African village you can connect to a supercomputer in LA” to process the images, he adds. Next year, Karin Nielsen, an infectious disease pediatrician at UCLA, will venture deep into the Amazon to compare the portable microscope’s ability to diagnose malaria with that of old-fashioned microscopy. Nielsen is also testing the microscope’s ability to diagnose anemia, low white blood cell count, and intestinal parasites in stool. Persidis: This is an exciting new technology that showcases ingenuity away from preconceived ideas. Brembs: It is a cheap way of doing something that usually requires a microscope. The life science community, particularly the drug-development world, has embraced in vivo optical imaging as an important research tool. But optical imagers have traditionally used a light source on only one side of the animal and a single camera or detector on the other, limiting the quantification and localization of fluorescent tags. This past September, Bioscan introduced BioFLECT, the first 360-degree optical imager, which uses a rotating ring of 48 detectors to generate a full 3-D scan of fluorescent markers. The standard package, the BioFLECT 400, sells for $295,000 and includes four lasers (to activate the fluorescent molecules) and four filters (to measure only the desired wavelength of emission), but the machine can be equipped with up to 12 different lasers and 16 different filters. “You may want to label some cancer cells at one wavelength, and then inject some kind of therapy that you’ve colabeled at another wavelength,” says James Masciotti, Bioscan’s lead imaging scientist on the project. Kiebler: The promised range of resolution would be a clear improvement and very desired in the field to detect signals in living specimens. It would be fantastic to bring this as a routine system into standard imaging labs dealing with animals. Wiley: This instrument should greatly enhance the sensitivity and accuracy of locating fluorescently labeled cells and compounds in live animals, enabling a whole range of in vivo experiments. When Mark Poritz, director of biochemistry at Idaho Technology Inc., wanted to demonstrate how simple it was to use the company’s FilmArray system for identifying pathogenic strains in patient specimens, he had his 9-year-old son man the machine. His son successfully rehydrated the PCR reaction pouch and injected a prepared sample of the specimen before sliding the pouch into the $50,000 machine and starting the reaction. One hour later, the results were ready. The FilmArray system was designed to make pathogen detection simple, accurate, and fast. According to Ray Widen, director of molecular diagnostics at Tampa General Hospital, it does just that. Widen’s facility, which tests bronchial and nasal swab samples from patients before and after organ transplantation, was running separate PCR reactions for flu, respiratory syncytial virus (RSV), and parainfluenza virus, and it cost “$340 to do that whole panel,” he says. Because there are multiple nested PCR reactions within each FilmArray pouch, one run can detect all of these pathogens, and others, at a cost of less than $150, explains Widen. Plus, the FilmArray reaction does not require a trained technician and only takes an hour rather than the 5–6 hours needed for a traditional, real-time PCR reaction. All of the sample preparation and DNA purification steps are contained within separate chambers in the FilmArray pouch. Currently, Idaho Technology has FDA approval for the diagnostic use of only one FilmArray test—its respiratory panel, which detects 15 respiratory pathogens, including RSV, rhinovirus, and several strains of influenza. But the company is also developing panels for detecting blood-borne bacteria and common fungal pathogens, as well as one for gastrointestinal pathogens, including enterohemorrhagic strains of E. coli (EHEC); a sexually transmitted diseases panel; and a biothreat panel. Wiley: Incredibly easy one-step multiplexed PCR. Anyone could operate this instrument. Persidis: PCR detection at essentially a point-of-care scenario is an important advance and this technology sets the stage. CyTOF, the instrument that Tanner described, is a mass spectrometer that can feed researchers data about molecules within and on the surface of individual cells, revealing not only the cell’s identity but also some of its functions. By attaching mass-spec-detectable stable isotopes to antibodies specific to a biomolecule of choice, researchers can harness the speed and specificity of mass-spec analysis, giving what approaches an “omics” view of individual cells. Most omics analyses take an average reading from a large population of cells, obscuring subtle differences in individual cells or subpopulations of cells. “I saw us being able to look at the whole immune system at once and all of the biology it could do,” Nolan says. Nolan used the machine, which costs about $600,000, to better elucidate a broad range of immune-cell developmental stages and signaling responses, providing a mineable resource for immunologists studying those cell types. The results, including some revealing new findings, were published in a recent Science paper (332:687-96, 2011). Nolan plans to use the other two machines he bought to hunt for weaknesses in individual cancer stem cells, with the hope of developing drugs that could target this small subpopulation. “A lot of very good drugs have been thrown out with the bathwater,” says Nolan, because they were applied to a broader population of cells. Wiley: Revolutionary instrument allowing the analysis of potentially over a hundred different antibodies binding to thousands of cells. It will enable a new generation of systems analysis at the single-cell level that can be directly applied to clinical samples. The invention of structured illumination microscopy (SIM) in 2000 by University of California, San Francisco, researchers revolutionized high-resolution optical imaging by breaking through the diffraction barrier that limits conventional microscopes to a resolution no finer than 200–250 nm. The technology, which involves shining patterned light on a subject from different angles and then using computer algorithms to extract information from the resulting fringe patterns to produce a high-resolution image, doubled the resolution possible using conventional optics. Nikon took notice of this achievement and incorporated SIM technology into its flagship inverted microscope to produce the N-SIM Super Resolution Microscope—one of the fastest and most powerful high-resolution optical microscopes on the market. Announced in the spring of 2010 and delivered in 2011, the N-SIM microscope can achieve a spatial resolution between 85 and 110 nm and a temporal resolution of 600 milliseconds per frame, which allows for dynamic, live-cell imaging. A total of $600,000 will buy you “everything you need to have the system fully operational,” O’Connell says. This includes software, lenses, filters, a highly sensitive camera, two lasers (upgradable to five) for fluorescence microscopy, and “the table that the microscope sits on.” However, the system is highly modular, O’Connell adds, allowing for the combination of other technologies—such as confocal microscopy and Nikon’s STochastic Optical Reconstruction Microscopy (N-STORM) system—with the same microscope. Kiebler: Structured illumination has been shown to improve imaging in the nm range. It would be fantastic to bring this as a routine system into standard imaging labs. 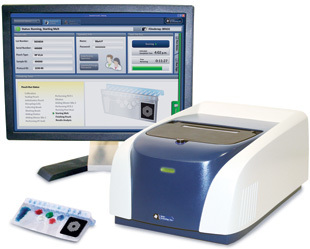 RainDance Technologies’ ThunderStorm System for DNA sequencing is the newest iteration of the company’s popular next-generation RDT1000 model. While other PCR enrichment systems allow researchers to process fewer than 100 gene regions, the ThunderStorm allows researchers to sequence up to 20,000 regions per sample. The product is ideal for large genome-wide association studies with thousands of samples where researchers want to target regions of interest for more complete sequencing, Watson says. The ThunderStorm also has a “deep-sequencing mode,” Watson adds, which allows researchers, like those at the BC Cancer Agency, to identify dozens of cancer-causing mutations in tumor cells—whether the mutations are present in 1 or 100 percent of the cells. The system costs about $295,000 and each sample consumes about $100 to $200 in supplies. Watson won’t disclose how many have been sold, but the product is aimed at pharmaceutical companies and centers that do large amounts of genetic screening, he says. Wiley: This is an extremely elegant, fully automated, high-throughput, targeted resequencing system based on a unique approach for creating and merging millions of individual microdroplets of reactants. Owning a magnetic resonance imaging (MRI) machine generally requires a lead-lined room, a plumbed-in cooling system, expert operators, and a few million dollars. Now, all you need is about one square meter of space and $500,000. Lenkinski superimposes the images he generates with images taken by a positron emission tomography machine. Before getting the M2, this proved difficult, because the MRI machine he used was several floors away. Now both machines are next to each other in his lab. Persidis: A portable MRI instrument that can be used in a non-expert dedicated lab represents a significant advance for this important technique. Wear it as a wristband, badge, pendant, or pin it to your shirt or hat—the Dimesimeter isn’t the latest fashion statement, but it may offer researchers insights into how disrupting circadian rhythms affects human physiology, behavior, and disease. Developed by scientists at the Lighting Research Center at Rensselaer Polytechnic Institute, the battery-powered, dime-sized Dimesimeter contains optical sensors and accelerometers that measure both the light exposure and activity of the person wearing it. The device then transmits data wirelessly to a docking station, which can be linked to a computer. “Biology is driven by circadian rhythms at every level,” says Mark Rea, director of the Lighting Research Center and one of the developers of the device, which costs $100. “By quantifying the amount of light that people are exposed to, we’re getting new insights into a lot of diseases.” Rea and Mariana Figueiro, Light and Health Program director at the Lighting Research Center, employed the Dimesimeter in a study that determined optimal home lighting conditions to improve sleep efficiency in Alzheimer’s patients. The Dimesimeter’s optical setup consists of red, green, and blue light detectors that measure light exposure of the subject. Through post processing, researchers can determine the amount circadian light (the light that modulates the biological clock) entering the eye. “It is the first and only of its kind that measures light as it impacts the visual system and light as it impacts the circadian system,” says Figueiro. Since the device was first introduced in June 2011, more than 300 units have been deployed around the world. Onboard memory capacity allows data to be continuously recorded for up to 33 days, depending on the logging interval. Because the devices are sealed with an epoxy coat, battery life limits the device’s lifetime to at least 10 weeks of operating time and a year on standby. Brembs: This seems to be an easy way to trace the circadian habits of many people over quite long time scales. To prepare material for analysis by mass spectrometry, chemist Akos Vertes of George Washington University developed Protea Biosciences, Inc.’s LAESI (Laser Ablation Electrospray Ionization) DP-1000 System, which can handle any type of biological sample that contains water—either naturally, as in animal or plant tissues, or water added by the experimenter. The sample is first subjected to a mid-infrared laser exactly 2,940 nm in wavelength, which corresponds to the frequency at which the O—H bond in water vibrates. As a result, the laser creates “a little volcanic explosion,” says Protea Chief Science Officer Matthew Powell, “and everything within that crater is thrown up into the air,” instantaneously converted into a gas. The vaporized biomolecules intersect with a high-voltage electrospray plume, which adds a charge to the components and dissolves them in water droplets so they can be identified using traditional mass spectrometers. Brent Reschke, senior scientist at Protea, has already put the technology to work identifying the chemical signatures of plant leaves, flower petals, and frozen organ tissue samples from mice. Now he’s collaborating with West Virginia University (WVU) researchers to examine frozen samples of human skin “with the ultimate goal of being able to go through and map out skin cancer,” he says. So far, the technology is compatible with mass spectrometers from two vendors, Thermo and Waters, and Protea is working with AB Sciex to develop an integration kit for its mass spectrometer as well. The unit, including the software and integration kit, costs $240,000. Protea plans to send its first shipment of the technology to buyers this quarter. Wiley: A new way of doing imaging mass spectrometry that gets away from some of the extensive sample preparation previously needed. Should make MS-imaging more reproducible and accessible. A few years ago, a new super-resolution technique increased fluorescence microscopy resolution tenfold by effectively breaking the 200–250 nm diffraction limit—the minimum spacing at which two objects could be seen separately. But, says Chris Vega of Leica Microsystems, the method had two shortcomings: the need for specialized fluorescent labels and the occurrence of drift during image acquisition. Both of these have been addressed in the new Leica SR GSD microscopy system, which rounds out our list of this year’s top innovations. It’s impossible for a standard fluorescent microscope to resolve objects less than 200 nm apart because their emitted light waves overlap. Super-resolution microscopy gets around this hurdle by illuminating only a few random molecules in the field of view at a time, taking a picture, and then repeating the process thousands of times until all the molecules have been illuminated and imaged. Neighboring objects are unlikely to be illuminated at the same time and thus can be visually separated. The random-illumination strategy has traditionally required specialized photoactivatable labels, but the SR GSD approach involves high-powered laser excitation of standard fluorescent labels, which causes them to randomly switch to a temporary dark state. “The GSD allows us to use the set of fluorescent ALEXA dyes and antibodies that we are also using for classical epifluorescence,” says Ralf Jacob of Philipps-Universität in Marburg, Germany, who owns one of the systems. “This is a great advantage,” he says. To address the second problem—drift—Leica developed the SuMo stage, which stands for Suppressed Motion. “The stage actually mounts to the objective, which keeps the two spatially aligned,” explains Vega. The stage also has a motorized self-correcting mechanism. Both solutions are aimed at “making super resolution accessible and easy to use for the researcher,” says Vega. He declined to reveal how much the system costs. Kiebler: Many people consider improvement in imaging as one of the most exciting fields in light microscopy. It would be fantastic to improve imaging in the nm range. Björn Brembs received his PhD from Würzburg University in Germany where he worked with Martin Heisenberg on associative learning in Drosophila. After a postdoc with John Byrne at the University of Texas in Houston working on operant learning in the marine snail Aplysia, he started his own lab at the Freie Universität in Berlin in 2004. Since 2009 he has been a Heisenberg fellow there and still studies spontaneous behaviors and how they are modulated by learning. Michael Kiebler is a neuronal cell biologist at the Medical University of Vienna’s Center for Brain Research. He studied chemistry in Munich, Germany, did his PhD with Walter Neupert on protein translocation into mitochondria, and completed a postdoc with renowned neuroscientist Eric Kandel at Columbia University in New York. Carlos Dotti at EMBL Heidelberg supervised Kielbler during his senior postdoc, which he did before becoming a junior group leader at the Max Planck Institute in Tübingen, Germany. H. Steven Wiley is the lead biologist at the Environmental Molecular Sciences Laboratory (EMSL) at Pacific Northwest National Laboratory, where he utilizes cell imaging, computational biology, and high-throughput proteomics to study cell communication. His work combines the techniques of molecular and cellular biology with both biochemical and optical assays, and uses the results to construct computer models of cellular processes. He sits on the editorial board of The Scientist, and is a frequent contributor to the magazine. Aris Persidis is president and cofounder of Biovista. He is also a cofounder of Cellzome, in Heidelberg, Germany. Persidis is a recipient of the Honeywell European Futurist Award (1986) and has published extensively on bio-business subjects. He also serves as an expert evaluator for the European Union and holds a First Class BSc degree in biological chemistry from Essex University, UK, and a PhD in biochemistry from the University of Cambridge, where he was also UK varsity ballroom dancing champion.